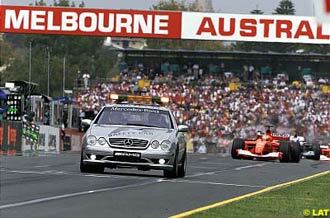 It's lap five of the 2001 Australian Grand Prix. Three corners into the Albert Park circuit, two drivers fighting for position collide. In the impact, a car crashes into a barrier and the track is littered with debris, while numerous spectators are caught by flying fragments and one marshal lays seriously injured. Race stewards analyse the situation quickly, taking in information from cameras, from marshals, from observers. As the world watches TV replays of the crash and live images of drivers stepping away unharmed from their wrecked cars, the signal is given to deploy the safety car. The safety car was waiting in the pitlane since following the field around the circuit for the formation lap of the race. Now, it has a job to perform. The silver Mercedes Benz road car leaves the pitlane, waiting for the field of F1 cars to line tail around the circuit and join up behind it. A slow precession begins as track marshals battle to clear debris from the corner, but it is evident for all to see that the track is still littered with tiny shreds as the field passes the accident scene for the first time. Unseen by the world, medics battle to save the life of a marshal, who has been seriously injured by a flying tyre from the accident. The field crawl around the circuit, lap after lap behind the safety car. The marshals clear away the debris, the medics continue their battle. A medical ambulance sits ominously track side, waiting to take the injured person to hospital. Yet more slow laps pass, before the field reaches the slow moving ambulance, ferrying its occupants slowly to hospital. The field passes the ambulance, the fans get excited. Formula One is about to go racing again, and sure enough, the safety car pulls back into the pits, and the race is go. The situation, however, was far from exciting. Seven years ago, at the start of the 1994 season, the FIA reintroduced the safety car to Formula One. Taken from the US racing series Indycar, the safety car would be used during the race, if an accident or event endangered the lives of the drivers. Its purpose would be to slowly lead the cars around the circuit until the danger had passed. It was seen as an easier option to stopping a race, and also held an advantage of bunching up the field, producing more action and excitement when the race finally got back under full speed. The FIA reintroduced the safety car early in the 1994 season, at Round 1. It was, however, met with caution by experienced drivers Ayrton Senna and Gerhard Berger. The pair had complained that the safety car introduced new dangers to the cars following behind it. Their argument was that running at such low speed, for so long, was having the effect of decreasing tyre pressures. This would then result in the car's ride height - an important factor in how the car handles - becoming lower. Simply put, the tyres would get colder, and the car would become harder to drive. At Round 3, Imola, the reassembled GP Drivers Association (GPDA) met on the morning of the race - a day after Roland Ratzenberger was killed in a fatal accident during practice. Senna was of the more vocal drivers in that meeting, and he was particularly concerned about the use of the safety car on the warm-up lap before the race, as well as in the case of an accident during the race. Along with Berger, he reasoned that the safety car simply was not able to go fast enough, cooling the tyres and decreasing their pressure. At the end of the meeting, the GPDA's proposal to the FIA representative was that the safety car would not be used again. The San Marino Grand Prix started off with yet another dramatic accident, and contrary to the drivers' request, the safety car was brought out, leading the cars for over 5 laps while track marshalls cleared debris off the track. Then, the race was restarted, only to see Ayrton Senna's car leave the track violently. The Brazilian died in that crash. In the aftermath of that fatal accident, many believed that the decrease in tyre pressure on Senna's car, having followed the safety car for several laps, was indeed a vital factor - although not necessarily the only one - in the cause of the crash. If true, Ayrton's fears may well have been realised in the most tragic way. "The safety car may be brought into operation to neutralise a race upon the decision of the clerk of the course. It will be used only if competitors or officials are in immediate physical danger and the circumstances are not such as to necessitate stopping the race." The ruling itself is wise, but it also introduces extra dangers to the drivers. Sunday's race saw the field of drivers stream past the crash scene and driving over debris as they followed the safety car. This in itself is dangerous, and could have caused damage to tyres. A total of 10 laps were run behind the safety car, causing the tyres to lose pressure and thus making the cars unpredictable as the race restarted. The drivers took the first few laps cautiously, but being bunched up into a tight field, caution may well have had to make way for aggressive driving to retain positions. The danger and risk of a big accident was present, and many watch those first few laps nervously, breathing a sigh of relief as they kept safe. But will they be so lucky next time? Does it really make sense to introduce more risks, to avoid risks? Should the FIA have listened to Ayrton Senna and Gerhard Berger in 1994, and removed the safety car from Formula One altogether? And what are the alternatives? In the event of a major incident, that may leave debris on the circuit, or someone injured, a sensible solution would perhaps me to stop the race. The cars would form on the grid, the teams would immediately be able to check the tyres for damage, to ensure the pressures are kept at the right levels. The track marshals would have as much time as needed to clear the track fully and properly. The medical teams would be able to perform work on any injured parties, before driving the ambulance, unheeded by a field of Formula One cars, around and away from the circuit. The safety car could be sent out only when all is cleared, leading the cars around on one single pace lap, before allowing them to perform a rolling restart. The tyre pressures would be similar to race start pressures, giving the drivers less unpredictable handling problems. The risk of debris causing possible tyre problems would be dramatically reduced. All in all, the first few laps would be safer. Looking back over a year, a similar situation occurred during the 2000 season, after the terrible first lap collisions at Monza. Again, the safety car was utilised to lead the field past medics, as they battled to save the life of the fatally injured marshal. It was not a pleasant scene, as lap by lap the cars drove slowly past a team of medical workers and ambulance. The question also has to be asked with regards to ethics: should the race continue in such a way, while someone directly related to the race lays injured, perhaps fatally, at the side of the track? Should the cars stream past, almost impatiently, lap by lap? The roar of their engines, slowly passing, almost disrespectful to the situation. While spectator fence regulations, tyre tethers and marshal safety go under the spotlight, the Formula One world must also recognise the hidden risks of the safety car.